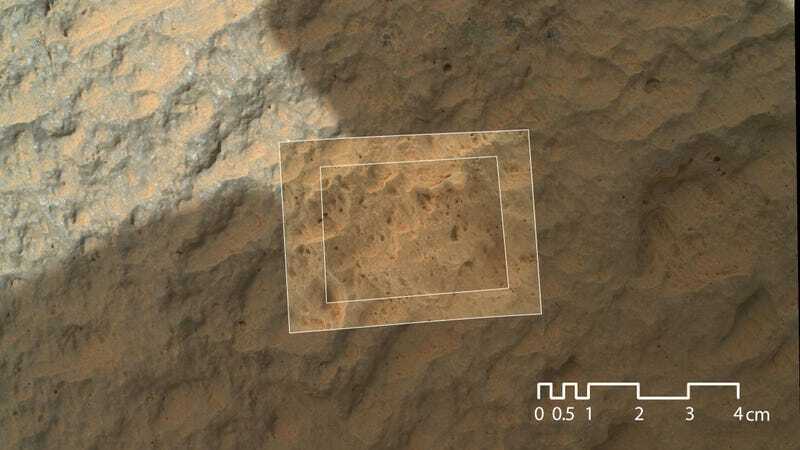 The Mars Curiosity Rover has touched a Martian rock for the first time. And, in the process, it gave us the closest, most detailed view of the Red Planet (a tiny part of it) yet, using her Mars Hand Lens Imager (MAHLI) camera at ten, two and one inches from the rock. The target was the pyramid-shaped rock of unknown origin, named Jake Matijevic in honor of the Mars Rover surface operations systems chief engineer who recently passed away. The origin and composition will be known soon: the rover examined Jake Matijevic with its Alpha Particle X-Ray Spectrometer (APXS), one of the instruments at the end of its multi-use robotic arm. Then it used its ChemCam (Chemistry and Camera instrument) to shoot laser pulses to determine the rock's chemical composition.